I’m joining up today with the ladies from No Place Like Home to share our cookie recipes with you. It won’t be long and many of us will be busy in our kitchens baking for the holidays. I try to bake ahead of time, then freeze my cookies and remove to thaw and serve. Then it always taste like I just baked it that very day! There are so many different variations of this Hungarian Kifli Cookie recipe, but the one I’m sharing with you has been used in my family like forever! When my sister had her bakery, she made a version of these kiflis to sell to the public; and I’ve given away many of these as Christmas gifts to friends. 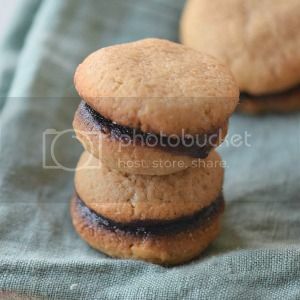 Different fillings can be used in them, but I prefer the ground nuts or apricot filling. 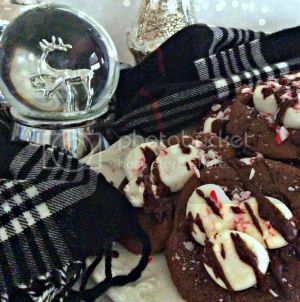 An authentic Hungarian Kifli cookie recipe. Make the Nut Filling first! Finely grind the 2 cups of walnuts. If you're using a food processor, grind the walnuts WITH the granulated sugar. Beat the two egg whites, but DO NOT make them too stiff. Gently stir the ground nuts and sugar into the egg whites. Mix the cream cheese and butter together. Add the flour and salt and mix together until it resembles pie dough. Divide the dough into three equal sections. Flatten each section to about 1/2 - 3/4 inch thickness, like a hamburger. Wrap each one individually with plastic wrap. Chill the dough in the refrigerator for at least 4 hours or overnight. Sprinkle powdered sugar on your board or counter. Remove a wrapped dough from the refrigerator, one at a time. You don't want the dough to be too soft for rolling it out. Roll the dough in a circle until it's 1/16 -1/8 inch thick. It needs to be much thinner than a pie crust. If the dough starts to soften too much or starts to stick to the board, keep adding more powdered sugar to the board or the top of the dough. Cut the circle into 16 pie wedges. Place 1 teaspoon of nut filling, at the wide end of each wedge. DO NOT spread the filling. Starting at the wide end where the filling is, start rolling the wedge towards the center of the circle, like a crescent roll. Place pointed-side down on an ungreased cookie sheet. Bake in a preheated oven at 375 degrees for 10-15 minutes or until a light golden brown. After they've cooled off, sprinkle powdered sugar over the baked kiflis. Over the years, I started making the nut filling and the dough, a day before I actually roll them out and bake. If you have a food processor, just add the 2 cups of nuts and the sugar and process them together. Otherwise, grind your nuts with a nut grinder and add the sugar to the bowl with the ground nuts. After beating the 2 egg whites, add them to the nuts, or vice versa, it really doesn’t matter. Add in the lemon juice, mix together and put aside until you’re ready to fill the kiflis. If you bake the next day, cover the bowl with plastic wrap and keep in the refrigerator until ready to use. The original recipe called for 2 small cream cheese packages, that weighed 3 oz. each, but now days, I can only find the 8 ounce size, plus the larger size is less expensive. Let the cream cheese and butter come to room temperature and soften. You can use a mixer if you like, but I find a wooden spoon is just as efficient in mixing the cream cheese and butter together. Add a pinch of salt and the 2 cups of flour and mix together. For this part, you can use a wooden spoon, mixer or even you clean hands. I always get three sheets of plastic wrap and lay them on the counter ahead of time. After the dough is well mixed, divide them into three equal balls and lay one on the top plastic wrap. Flatten this to about 1/2-3/4 inch thickness, just like you would if you were making a hamburger. Then carefully wrap the flattened dough in the wrap. After all three have been flattened and wrapped, place in the refrigerator for 4 hours or until well chilled and hardened. Remove only 1 wrapped dough at a time from the refrigerator. Sprinkle your board and rub your rolling pin with powdered sugar. DO NOT use flour! If the dough gets sticky, just add a bit more powdered sugar to the board or the surface of the dough. It will just add a bit of sweetness (always a good thing) and not toughen the dough like flour would do. Roll the dough into as thin a circle as you can go. It should be thinner than a pie crust, maybe only 1/16 to 1/8 inch at the very most. Start cutting into wedges until you have 16 total. Begin like shown above. Add a teaspoon of nut filling (or a bit more) at the widest end of the wedge and start rolling it towards the center. Do not spread the filling. As you roll, if you have issues, just use a bit more powdered sugar. You want to keep moving along before the dough gets too soft. Place the crescent rolls, point-side down on an ungreased cookie sheet. I usually use parchment paper, and if you use any other kinds of filling, such as apricot, definitely use parchment paper. After they’ve cooled off, sprinkle with powdered sugar. If you decide to freeze the kiflis, DO NOT sprinkle with the powdered sugar until you’ve taken them out of the freezer and they have reached room temperature. 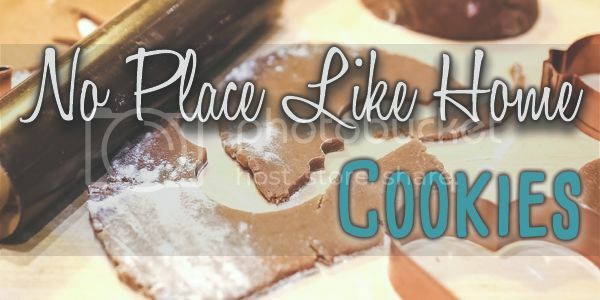 Make sure to check out the delicious cookie recipes from all of us at No Place Like Home! I. like the series of photos with the instructions. I am glad you show a circle that does not have perfect edges -much more realistic. I always pick these if they are on a cookie plate. Maybe with your instructions I'll get brave and try them! Hi Carol, Your cookies sound amazing!! I can see why they were a hit at your sister's bakery as well as with your family! I suddenly wish we lived closer. It would have been fun to do a real cookie exchange! These look amazing Carol! I have never tasted these before. But I think I would love them, I want to give them a try! I have pinned them to my board yummy food! Wow! 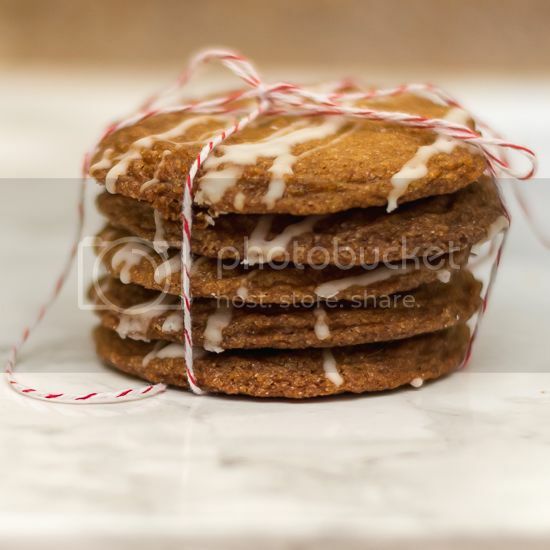 I've hadn't heard of kifli cookies before, but they look amazing! I bet they taste so good with the nut filling! Thanks so much for sharing this! These look delicious! I have found that cookie made with cream cheese have the best texture and taste. Thanks for sharing! 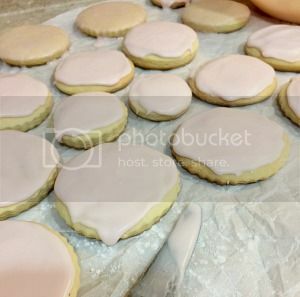 Mmmm, I love Christmas cookies of all kinds. These look delicious. 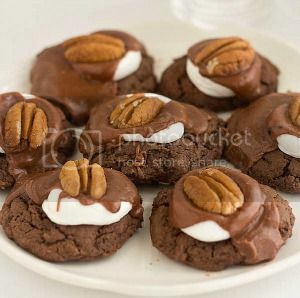 Carol, I've never heard of Kifli cookies before, but these look so delish! I love a cookie that is light and flaky with a filling. I am pinning these to try, they would be great to take to holiday get togethers. Thanks. Hi Carol! I haven't had these in years, and I'm so glad you are sharing your recipe. A friend 's mother used to make them by the dozens and share them with her family. Once in a while, I would get a small box of them. When I asked her for the recipe, she refused and said it was too hard to make. I would never be able to do it. I think she just wanted to be the only one who handed out these treasures. They look wonderful! 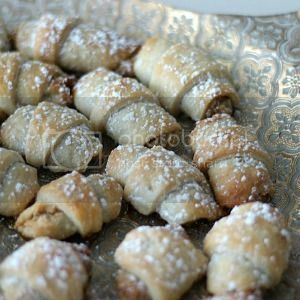 We have something that looks very similar over here - rugelach - though they are filled with chocolate. These look so delicious! I have never tried these before and look forward to trying them! YUM! Thanks for linkin' up with What's Cookin' Wednesday! Carol these look so yummy, I'm licking my lips as I read it. Pinning and I'll have to bribe my girl to help me with these. Carol, I wish you a very happy Thanksgiving. This recipe has brought back so many memories for me. I used to make these with my Grandma and we used raspberry jelly. Thanks for sharing your recipe with the Waste Not Wednesday link party. Carol, these look so scrumptious!! Thanks for sharing the recipe! I was googling and ran across this. This looks very similar to our families recipe. My grandma used to make them and now my mom does. They are the best and now my daughter is crazy about them too. I tried to make them once and they didn't turn out the best but still pretty good. My daughter is a better baker than I am, so I hope she is able to master these one day. It's pretty much the exact same recipe. Same ingredients minus the salt, amounts for filling a little different as are the instructions. And I think my mom rolls it out thinner which is what I had problems with. She always stresses "paper thin". I'll have to give it another try sometime before too long. 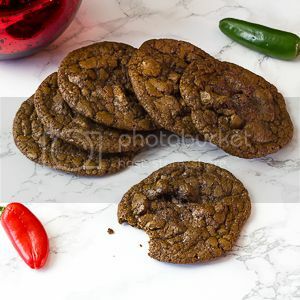 Today had me in a cookie thinking mood, and while I set out to find a boiled gingerbread cookie my mind got to wandering and thinking of my late husband and how every holiday season he would rave on and on of his mom's kieflies. Having grown up in Texas they were new to me. His family was from Southern Michigan just a few blocks from the state line. We received a cookie tin with a few in it one year, I think I got one. LOL We never went north during the holidays so sadly this was one family recipe I never received my training in. This year I think I'll bake a few batches and send them up North. My beautiful mother-in-law and husband have both been gone 11 years now, I'm sure they will bring back many sweet memories for the family and hopefully a warm smile to my 96 year old father-in-law. Thank you for sharing the recipe. Thanks for stopping by and commenting, Kelly! I've made it with apricot and love it, but now I'm down to just making one batch and have chosen the nut filling. Maybe next year I'll make that one and only batch with apricot. I used to make up to four batches and gave them away as gifts. Happy New Year! My dad is Hungarian. He remembers his mom making these for him when he was a kid. I didn't have her recipe so I took a chance on yours. He said they are just like he remembers them. Thank you for helping me bring back a piece of my dad's childhood! Christina, I'm so happy you found my family's recipe! There's different variations, but for the most part they all end up tasting about the same way. Happy New Year! Just stumbled on this. Great recipe and directions...couldn't quite replicate Mom and Grandma's but will keep trying. Will try your chicken paprikas next My grandparents all came from Hungary and we had the chance to go there last year....wonderful experience. Highly recommend it if you can go. I plan to use this recipe for the first time making these, but need to know: are the walnuts measured before or after they're ground fine? A measurement giving the weight would be more accurate and very helpful if you have it. Thanks for all the pictures; it will help a lot! They look delicious, Carol! I must try your version :) Season Greetings!